TM-White is a product much like the white striping material used on pavements for controlling traffic. Much of this is still in use after many years of traffic crossing it. In fact, there is no good way to remove it. The city and state employees normally paint tar over it if traffic patterns are changed. TM-White with age becomes more wear-resistant and waterproof. TM-White could not be a protective coating against large hail. It is impossible to engineer a coating against large hailstones. A coating of TM-White over a previously black or colored roof can reduce air conditioning costs as much as 20%. We have observed black roofs that had the TM-White applied next to the black tar paper and tar. A person could lay his face on the white where he could not bear to hold his hand on the black section. This was on a day of 80° or more temperature. Emphasis must be placed on the fact that the black roof absorbs so much that given enough time this absorbed heat will destroy the paper, tar, and decking materials. The interior of the building has to contain this heat. More insulations are required under the roofing to prevent this heat from raising the temperature in the rooms below. A TM-White roof will, of course, reflect the sun’s heat back and the roofing materials will not be undergoing this terrific heat. The attic or space between ceiling and roof will never be nearly so hot. A small amount of insulating materials above the ceiling will do better than the large amounts that are required for black roofs. TM-White can be applied by anyone. The best application is with a wide paint brush. This material flows and levels as well as the best house paint. 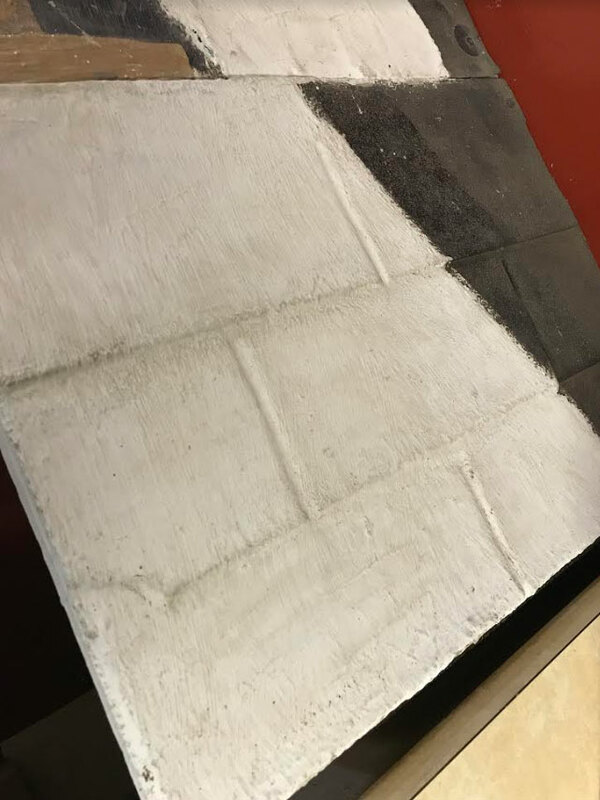 There is just the right amount of solvent in TM-White so that it will merge or fuse with the tar on built-up roofs or with the asphalt in composition shingles. The better application is two coats because you are adding thickness to the cover. At the low price of TM-White, a two-coat job is very reasonable. TM-White will normally dry to touch within thirty minutes to one hour. Reports that roofs with considerable pits and signs of erosion which were leaking in numerous places, were stopped and a very attractive roof was obtained. Throughout our tests we were able to cover 100 square feet or better of area on tar-paper roofs. The coverage may be somewhat less on composition shingles because in brushing the joint cracks and the lower edges of the shingles will have a thicker deposit of TM-White. This is very thick viscous material. Normal paint weighs approximately 8 lbs. per gallon. Our TM-White weighs 13 lbs. per gallon. This roof coating is NOT a paint. It is a very heavy bodied material with an excellent adhesion factor to any tar or asphalt base product. The white is an excellent advantage for reflecting heat. Call 806-352-2761 for more information about our advanced roof coatings and sealants! Discount pricing and fast shipment!